The Grable test, with the Atomic Annie artillery piece used to fire the warhead. Operation Upshot–Knothole was a series of eleven nuclear test shots conducted in 1953 at the Nevada Test Site. It followed Operation Ivy and preceded Operation Castle. Over 21,000 soldiers took part in the ground exercise Desert Rock V in conjunction with the Grable shot. Grable was a 280mm shell fired from the "Atomic Cannon" and was viewed by a number of high-ranking military officials. 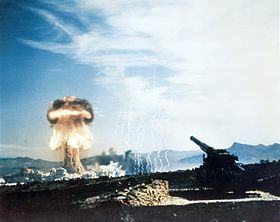 The test series was notable as containing the first time an atomic artillery shell was fired (shot Grable), the first two shots (both fizzles) by University of California Radiation Laboratory—Livermore (now Lawrence Livermore National Laboratory), and for testing out some of the thermonuclear components that would be used for the massive thermonuclear series of Operation Castle. One primary device (RACER) was tested in thermonuclear system mockup assemblies of TX-14, TX-16, and TX-17/TX-24, to examine and evaluate the behaviour of radiation cases and the compression of the secondary geometries by the primary's x-rays prior to full-scale testing during Castle. :192 Following RACER's dodgy performance, the COBRA primary was used in the emergency capability ALARM CLOCK, JUGHEAD, RUNT I, RUNT II thermonuclear devices, as well as in the SHRIMP device. :200 RACER IV (as redesigned and proof-tested in the Simon test) was employed as primary for the ZOMBIE:200, RAMROD and MORGENSTERN:318 devices. weapons development TX-5HE "XR-3" Type D pit 16 kt I-131 detected, 2.4 MCi (89 PBq)  Investigated yield-vs-initiation time curve. Live news coverage. Desert Rock V. Two 2-story houses, 50 autos, bomb shelters in effects test. 200 t I-131 detected, 28 kCi (1,000 TBq)  1st UCRL device, a uranium deuteride core,:202 meant to explore deuterated polyethylene mixed with uranium as thermonuclear fuel,:chap.15:203 and if successful to lead also to a compact thermonuclear primary. :149 Predicted yield was 1.5 to 3 kilotons, max. theoretical was 20 kt. :96 Device fizzled - deuterium moderated (slowed-down) neutrons more than expected and quenched the reaction. Embarrassing for designers, as it left 200 ft (61 m) of tower still standing (see image of tower). 11 kt I-131 detected, 1.7 MCi (63 PBq)  TX-5D proof test, a boosting experiment using lithium deuteride in solid or crystalline form, investigating initiation via deuterium; a cheap method to initiate a chain reaction. :185 Exploded 600 ft (180 m) ENE of intended zero point. 220 t:101 I-131 detected, 28 kCi (1,000 TBq)  2nd UCRL device, uranium deuteride:202 meant to explore deuterated polyethylene mixed with uranium as thermonuclear fuel,:chap.15:203 and if successful to lead also to a compact thermonuclear primary;:149 Used different mix from Ruth:202 and it also fizzled. Legend has it that 100 foot tower was used, to avoid embarrassment in case of fizzle. weapons development TX-16 "Buzzard" 23 kt I-131 detected, 3.6 MCi (130 PBq)  Component test of the TX-16 using a cryogenic mockup secondary and the TX-16 radiation case. Also tested RACER primary, which performed below expectations again. Desert Rock V.
weapons development TX-17/24 "Simultaneity" 43 kt I-131 detected, 6.3 MCi (230 PBq)  Component test of TX-17/24 series using the RACER IV primary, a modified RACER core containing two additional kilograms of HEU in the original design tested in Nancy, a thermonuclear secondary mockup. weapon effect MK-6D 27 kt I-131 detected, 3.9 MCi (140 PBq)  "Effects" test. Dropped 950 ft (290 m) SSW of target. Desert Rock V, bad exposures for troops and bad downwinder fallout. weapons development TX-13D "Hamlet" 32 kt I-131 detected, 4.6 MCi (170 PBq)  New hollow core design, most efficient pure-plutonium device under 100 kt indicates very good compression. Major effects testing of a high elevation explosion. Heaviest downwind contamination measured. weapon effect W9 (nuclear warhead) AFAP "Gun" 15 kt I-131 detected, 2.1 MCi (78 PBq)  The 2nd of four gun-type device tests. Fired from Annie M65 Atomic Cannon 11 km (6.8 mi) downrange. 280mm shell, 365 kg (805 lb). Detonation at 200 feet (61 m) SW of target. Desert Rock V. Major effects test. weapons development MK-7, "Cobra", Type D pit 61 kt I-131 detected, 8.6 MCi (320 PBq)  Proof test of a boosted MK-7 device, intended to be used as a primary in Castle. Initially it was intended only for the TX-15:195. After RACER's inconsistent behaviour it was opted for all "emergency capability" devices instead.:197. The bomb detonated 320 ft (98 m) NW of target. Composite implosion system in a Type D pit. Used Cyclotol 75/25 explosive mixture. ^ The US, France and Great Britain have code-named their test events, while the USSR and China did not, and therefore have only test numbers (with some exceptions – Soviet peaceful explosions were named). Word translations into English in parentheses unless the name is a proper noun. A dash followed by a number indicates a member of a salvo event. The US also sometimes named the individual explosions in such a salvo test, which results in "name1 – 1(with name2)". If test is canceled or aborted, then the row data like date and location discloses the intended plans, where known. ^ Rough place name and a latitude/longitude reference; for rocket-carried tests, the launch location is specified before the detonation location, if known. Some locations are extremely accurate; others (like airdrops and space blasts) may be quite inaccurate. "~" indicates a likely pro-forma rough location, shared with other tests in that same area. ^ Elevation is the ground level at the point directly below the explosion relative to sea level; height is the additional distance added or subtracted by tower, balloon, shaft, tunnel, air drop or other contrivance. For rocket bursts the ground level is "N/A". In some cases it is not clear if the height is absolute or relative to ground, for example, Plumbbob/John. No number or units indicates the value is unknown, while "0" means zero. Sorting on this column is by elevation and height added together. ^ Atmospheric, airdrop, balloon, gun, cruise missile, rocket, surface, tower, and barge are all disallowed by the Partial Nuclear Test Ban Treaty. Sealed shaft and tunnel are underground, and remained useful under the PTBT. Intentional cratering tests are borderline; they occurred under the treaty, were sometimes protested, and generally overlooked if the test was declared to be a peaceful use. ^ Include weapons development, weapon effects, safety test, transport safety test, war, science, joint verification and industrial/peaceful, which may be further broken down. ^ Designations for test items where known, "?" indicates some uncertainty about the preceding value, nicknames for particular devices in quotes. This category of information is often not officially disclosed. ^ Estimated energy yield in tons, kilotons, and megatons. A ton of TNT equivalent is defined as 4.184 gigajoules (1 gigacalorie). ^ Radioactive emission to the atmosphere aside from prompt neutrons, where known. The measured species is only iodine-131 if mentioned, otherwise it is all species. No entry means unknown, probably none if underground and "all" if not; otherwise notation for whether measured on the site only or off the site, where known, and the measured amount of radioactivity released. ^ a b c d e f g h i j k l m n o p q r Hansen, Chuck (1995). Swords of Armageddon. III. Retrieved December 28, 2016. ^ "Timezone Historical Database". iana.com. Retrieved March 8, 2014. ^ a b c Hansen, Chuck (1995). Swords of Armageddon. VII. Retrieved December 28, 2016. Cite error: Invalid <ref> tag; name "swordsoarVII" defined multiple times with different content (see the help page). Cite error: Invalid <ref> tag; name "swordsoarVII" defined multiple times with different content (see the help page). ^ a b Herken, Gregg (2003). Brotherhood of the Bomb. ^ Operation Upshot-Knothole Summary Report of the Technical Director. 1953. Retrieved February 17, 2019. Wikimedia Commons has media related to Operation Upshot-Knothole. This page was last edited on 26 February 2019, at 11:18 (UTC).